Shaw carries a full line of stainless steel sanitary weld 45 degree elbows. Stainless steel sanitary weld 45 degree elbows are used on permanent installations where process piping and equipment can be cleaned in place (CIP) and removal from the system is not required. Shaw Stainless offers weld fittings in 304 and 316L stainless in a variety of sizes. We house a huge inventory of sanitary weld fittings in 304 and 316L stainless steel. From caps and elbows to reducers and U bends, we have a complete inventory of stainless steel sanitary weld 45 degree elbows to meet your specifications. View our full line of stainless steel products. We have a large stainless steel sanitary weld 45 degree elbows inventory for complete order fulfillment and quick delivery. For more information, view our dimensional data. 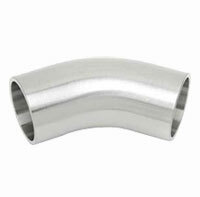 We offer stainless steel sanitary weld 45 degree elbows in a variety of sizes and specifications. Our Reference Catalog is designed to identify our stainless sanitary products including our stainless steel sanitary weld 45 degree elbows. Specification charts and general dimensional illustrations aid in identifying products. Stainless sanitary weld fittings are applied on permanent installations where various process piping and equipment can be cleaned in place (CIP). Removal from the system is not required. Our inventory of stainless steel sanitary weld 45 degree elbows end types include: weld x clamp, weld x bevel, and weld x thread.